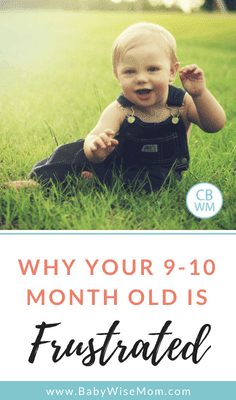 Why Your 9 or 10 Month Old Is Frustrated. What you can do to help your baby be more content and even sleep better. As your little baby grows up, she will come to find her once beloved toys a bit of a bore. 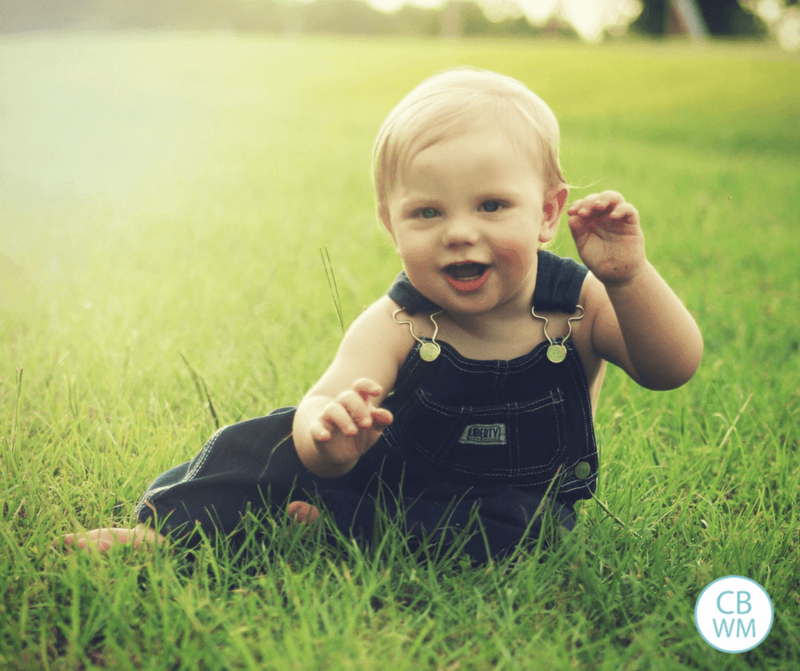 Babywise mentions rotating toys and keeping them age appropriate, but many moms still find themselves handing their 9 month old toys she played with as a 4 month old and wondering why she seems so discontented. It does seem to happen around 9 months old. They want new toys. They are more mature and ready for a change. My kids have both lucked out and had Christmas shortly before 9 months hit, so they had lots of new toys. If you have a spring baby, your child will likely have the same experience. Otherwise, very few parents are going to think about getting a bunch of new toys. It doesn’t have to be a lot. You know how you get a couple of new shirts and/or pants and suddenly your wardrobe has a whole new life to it? Get your child a couple of new toys and spruce up the toy collection. You can also add a lot of ordinary house objects at this age. Measuring spoons or cups, your mixing bowls. A pot with a spoon. Your old cell phone. Look around. Your child is fascinated with new items. Kaitlyn spent about 45 minutes straight one day playing with my measuring tape. I was surprised at her fascination. Also, be sure to rotate books. If you don’t own a lot, take advantage of your local library. Kids get attached to books, but they are also very excited for new books. Just keep it fresh. Keep in mind that your little baby is growing so quickly and needs appropriate stimulation. Rotating these toys will not only help your child perk up during playtime each day, it will also help your baby be tired enough to take good naps and sleep well at night. Babies in this age range will not sleep well if they are not mentally stimulated enough, and new toys can provide just the mental stimulation they need. If you need ideas of great toys for this age range, see my list of great toys for toddlers I have on Amazon. You can also see my list of toys for babies to see if there is anything there that would be great for your little one. I did not realize how true this was until we had our son. Many of the toys that people gave him BEFORE we got him were outdated…meaning they were too babyish for him. Nate loves my measuring tape too (I use for sewing)..how funny! I just bought him some stacking/ nesting cardboard blocks that he loves. We’ve already had to get rid of several and are now considering re-evaluating our current ones again. Thanks for the tips about household items. Sometimes I forget about that but it’s so true. I have a piece of advice on the toy thing then I have a question or need some advice. I have 2 boys 3.5 and 10 wk old. Toys: My 3.5 yr old and I clean out the toy chest every now and then and choose toys to give to a church, charity or good will. The rest are put away for baby bother.My Question or Cry for Help:My oldest son is a BW baby and we did the CIO in 3 days at 11 -12 wks. My 10 wk old on the other hand is now on his 6th night of crying it out and is still waking up. He weigh about 13lbs, and I have spoken to the Dr and they agree he is ready. We started on a Friday night. He had his dream feeding b/w 10:30- 11pm when he eats only on one side. Since Friday night he has woke up at 1:30am cried for 10-15 mins then back to sleep, wakes again at 3:30am and has cried for 15 to 20 mins straight that is when I go in pat give him his pacifier and pat him on the tummy and leave the room. After this he either sleeps until 4:15 or cries off and on until 4:45am then sleep until 5:30am when he eats on one side and then goes back to bed until his morning feeding b/w 7:30 and 8 am. 6 nights of this has drained me, but has left me confused! Any advice is welcome!! !Just a side: at 8 wks he did sleep one night from 8pm until 5 am, but has not done that again since. Sammy’s mommy,That is a great idea! What a great resource. Kamfam,Thanks for the toys advice! That is great to teach your son about donating to charity at such a young age.